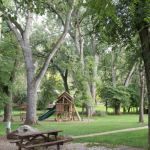 Ask fellow campers about "Lake Park Campground" and nearby attractions. Office staff very friendly and helpful. Good internet. We thought the cinder blocks used as site identifiers were dangerous; it would be easy to trip and fall. Right next to Canyon Lake Park, a great place to walk the dog. We camped at Lake Park Campground in a Motorhome. This is a small park - just about 40 sites. Half of them are on the south side of the park, with limited satellite TV access and no 50 amp (30-20 amp only) and no cable. The other half are on the north side with 50 amp and cable but no chance of satellite TV. The 50-amp sites cost ten dollars more per night than the 30-amp sites. If you want cable, the remote offered is an extra $5. Huge trees throughout the park are beautiful but make for tight roads and turns. We did manage with out 38' motorhome, however. 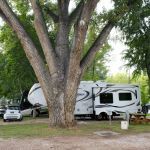 The park is run by some of the nicest people we have ever encountered in 18 years of RVing. They were so helpful, and just lovely. The park is very convenient to town and there is a wealth of things to do in a 50-mile radius. Make sure you know where your site is before you leave the office. The site numbers are very hard to see as they are painted on bricks on the ground behind the picnic tables! We camped at Lake Park Campground in a Motorhome. Don't miss the lovely Norwegian Chapel of the Hills just down the street, with services on Saturday evening, a small museum, and a gift shop with a sod roof! Also within 50 miles are Spearfish Canyon, Sturgis, Deadwood, Lead, Hill City, Crazy Horse, and of course Mt. Rushmore. You can easily spend a week here and not see it all. The best part about this campground -- for us -- is the location. Not a lot of traffic, 3 terrific parks within a mile including a 20-acre off-leash dog park, huge old trees for shade, and 5 minutes to grocery stores, hardware stores and other retailers. Electric is included. Water pressure a little low. $2/wash, $1 dry. They have a large number of rental cabins if you have friends or family who want to visit. Sites are close together but everyone has at least a patch of grass. We were able to maneuver our big rig between the trees without difficulty. Loads of deer & turkey in the area. Walk from your site to the creek or Canyon Lake for great trout fishing. We camped at Lake Park Campground in a Fifth Wheel. Dog owners: don't miss out on the HUGE Braeburn off-leash dog park a mile south on Jackson Rd. Be aware it is not fenced and does parallel the road. Rapid Creek runs through the park for water play. The lovely creek-lined Rushmore Lions park is directly across the street from the campground. Paved bike trails connect many of the parks on the west side of town. If you like to hike, visit the Skyline Wilderness Area! We stayed for 9 nights. The first two nights were at $82.50(last weekend of Bike Week) and the next six nights were at $61, with a free night to make it the 'weekly rate'. We've stayed at some tight sites before, and this is probably number 2 on the list for how close can you get to your neighbor . It's a relatively small park anyway, but they have folks jammed in as tight as possible. Because we still work fulltime we have two criteria when picking a park....full hookups, close proximity to an airport. After staying here, we'll be sure to add dog area to our list. The dog walk was across the street from park... like go out of the park, cross traffic and over to a patch of grass beside the bike trail. My dogs were freaked out by traffic so it definitely wasn't fun taking them out. It's not a bad park, but it's the equivalent of apartment living in the city. It worked for us because of the proximity to the airport, but if we come back to the area, we'll take vacation so aren't hindered by that criteria. There were amazing parks on the Custer State Park side. We camped at Lake Park Campground in a Fifth Wheel. Great place to stay for the Sturgis rally. It's away from the hustle and bustle but close enough for a nice ride. Staff were accommodating (they moved our motorcycle trailer after we unloaded our bike) and helped guide us as we backed into our site. We camped at Lake Park Campground in a Motorhome. NOTE: $72.50 is the Sturgis bike rally rate. Normally the rate is $53. I read other reviews saying the sites were too close, but I think they were fine. Enough room for our needs. The staff/owners are great. Really friendly and accommodating. The location is great. I took the dog for a walk every day in the campground and in the park adjacent to the campground. The park is marvelous; well maintained and lots to do. There were many campers with pets and everyone cleaned up after themselves. There is also a wonderful dog park just down the (paved) trail. I would definitely stay at this campground when in the Black Hills. It's on the edge of town so you have easy access to the city's amenities, as well as, easy access to the multitude of attractions in the surrounding area. We camped at Lake Park Campground in a Motorhome. This is an excellent park if you ride a motorcycle. It's a quick couple of turns and you're riding in the beautiful Black Hills. Overpriced, no amenities. The sites are small and shady no one was next to us so it wasn't bad, but if it were full, it would be cramped and noisy. Our site was not level. When we arrived, it was not busy, the owner checked us in we did not get a flyer listing camp rules, location of trash, etc. She seemed like since she already received 2 nights deposit, it did not matter that we were here. Owner lives on the property and seemed like we were imposing on her property. She then told us that cable would be $2 extra and we would be given a cable box that we would have to program and also call the cable company to turn it on. We asked if antenna would work and she said probably not. We did not purchase the cable, we did not raise antenna and received 14 channels very clear. Good wifi. This campground is okay if you just want a place to park your rig. We like to sit outside, relax and take in the views, but the only view we had was the backside and trash bins of the hotel next door. The lake is a short walk from the sites to a large grass field with not even a bench or table. This park is away from I-90 in town and not really easy to get to. This park is close to the attractions we were interested in seeing. We would not stay here again. We camped at Lake Park Campground in a Fifth Wheel. Wow, finding an RV park in Rapid City in October is dicey! I called a few and found out they were closed for the season. This one was still open, and the good news is..... they are open year round! The bad news is..... you have to weasle through Rapid City about 10 miles to get here, and there is road construction where you are holding your breath hoping you don't knock down one of the little divider sticks. The rate I am showing is with Good Sam Discount BEFORE taxes. Apparently, cable TV is $2 extra, but the owner forgot to ask me if I wanted cable when I checked in. When I asked about cable and Wi-Fi, he told me to go ahead and hook up to the cable. The cable had OODLES of channels. Wi-Fi worked great! The only down side is that the sites are cramped. The rental cabins are right behind your back window, and your next door neighbor is pretty close. Well, it's not "pass the poupon" close, but kind of cramped. No one was next to me at the time, so it wasn't bad, but I can see if it were full, it would be cramped! There are great trees for shade, but if you have slides, this could be a problem. I am only in a 32 foot Class C with 2 slides, but I had to position myself so the slides wouldn't hit anything. There is a great lake to walk to and sit near. I don't tow a car and this place isn't close to much to walk to. We camped at Lake Park Campground in a Motorhome. We made reservations for this camp ground in Feb. 2015. I paid for 1/2 of the stay before arriving. This camp ground is crowded and in the city. They put us in a pull through site on the street. The street was very busy and loud. The road construction around this camp ground is crazy. Buyer beware. When we asked if we could move into the camp ground instead of the street site, we were told no. I would have thought customer service would have been a priority. In our 4700 mile trip the only redeeming quality of this park is that is was close to the attractions we were interested in seeing. I would not recommend this camp ground to others. We camped at Lake Park Campground in a Travel Trailer. The RV sites for big rigs were extremely close with no grass. The roadwork taking place made getting to the park dangerous. The park was very well kept up, clean, great grassy areas by the cabins. The cabins also had covered parking areas by most of them. The staff were excellent, very friendly & helpful. We camped at Lake Park Campground in a Motorhome. Great location for riding each day on the Harley. Many sites to see; Mt Rushmore, Needles Hwy, Crazy Horse, Devils Tower. 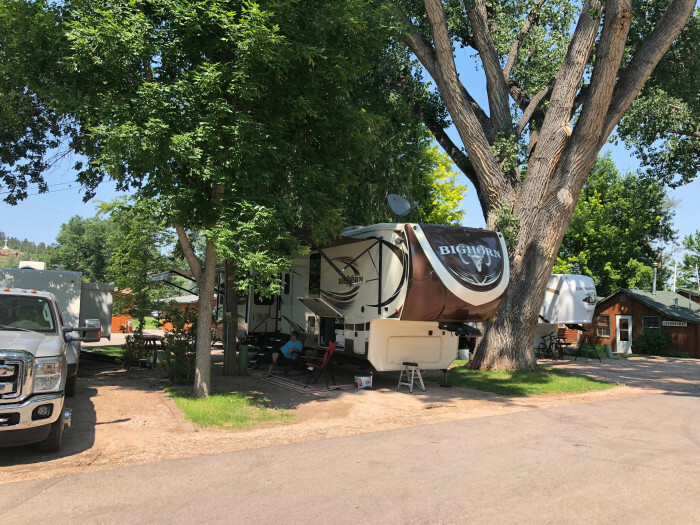 This park is a convenient base from which to visit Rapid City and sights in the area, including Mount Rushmore and Wind Cave National Parks. The campground is part of a larger facility that includes a number of cabins. The staff is friendly and helpful. The lake is easy to walk down to and there is a large, open, grassy area that is perfect for exercising a dog. The sites are level and decent-sized but kind of close together. We found the park to be noisy. We camped at Lake Park Campground in a Truck Camper. 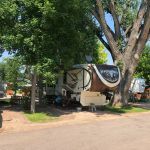 We stayed two nights at this campground and found the experience to be highly satisfactory, despite the fact that it was cold, windy and rainy in Rapid City for most of our stay. The park itself is small and a wee bit on the "rustic" side, but generally well-maintained, and the manager was a very congenial and accommodating guy. Given that we were travelling with a large pit bull, we were glad to find a nice little park across the street from the campground where we could walk her. In fact, due to the weather, we had the park to ourselves most of the time, which afforded us the opportunity to walk our dog off-leash once or twice. Also, the park backs up to a wooded hillside that is inhabited by mule deer. As I was returning from the park's trash dump on our first day, I suddenly found myself virtually face-to-face with either a large fawn or a small doe, which was a pleasant surprise for a dumb ole country boy from Ft Lauderdale. My only "con" is that the pull-thru sites are on the small side for a big-rig pulling a toad. If my coach was longer than 40 feet, I probably would have had to unhook and park my Jeep off the site. Bottom line: we'd stay here again if we were in the area. We camped at Lake Park Campground in a Motorhome. Are you affiliated with Lake Park Campground ?